A fire started in an overcrowded nightclub in Bucharest, Romania on 30th October 2015. No fire safety procedures were in place. Pyrotechnics being used as part of the show set light to a polystyrene pillar, which led to a stampede as everyone rushed for the venue’s only exit. Metal band ‘Goodbye to Gravity’ were just beginning their performance. 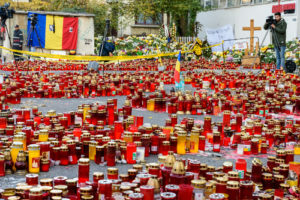 Prosecutors say that Cristian Popescu Piedone, the mayor of the Bucharest district where Colectiv nightclub was located, had granted them a permit despite no firefighter authorisation. 46 people have lost their lives, hundreds have been injured and the government is in disarray. Popescu, the Prime Minister Victor Ponta, and the Interior Minister Gabriel Oprea have all stepped down from their posts, after tens of thousands of people took to the streets to protest against widespread corruption in the Romanian political elite. The nightclub owners were arrested on suspicion of manslaughter. For any public event, particularly those that hold hundreds of people, the use of proper fire safety equipment and the following of proper procedures are paramount. It is the owner’s responsibility to put them in place and the government’s to shut down businesses that don’t. Effective communication saves lives: proper signage needs to indicate fire exits and location of fire safety equipment. Fire safety equipment meant for exporting must have accurately written coherent, manuals in the language of the destination country: if people are unable to read the fire safety signage or read instructions for fire safety equipment, they will not be able to save lives. Get in touch with me at hello@ttcwetranslate.com and +44 (0) 7436 865754 if you have any questions about translation for the fire protection industry. Download our ‘Nine Translation Slip-ups to Avoid’ brochure here, for some top tips and pitfalls to avoid when translating your documents.